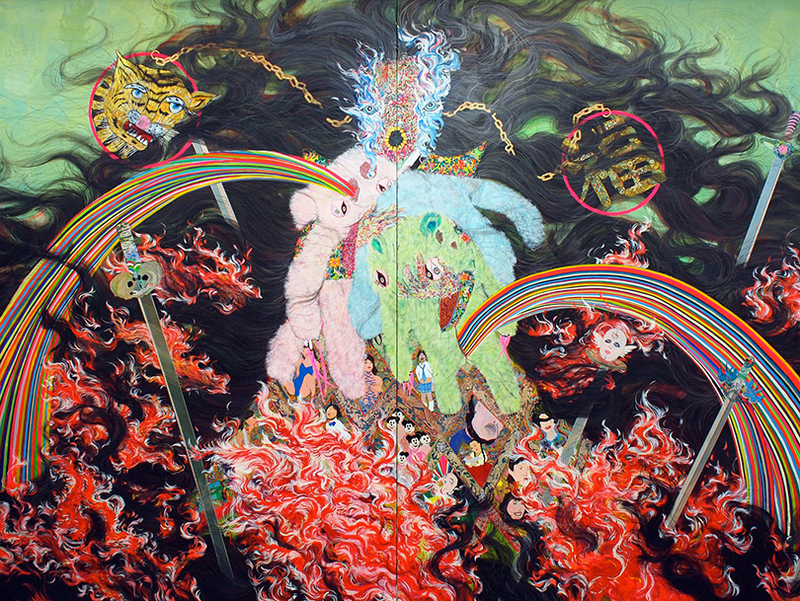 Hyon Gyon, 〈Flame〉, 2010. Acrylic and Japanese paper on panel, 225 x 360 cm. Private Collection. The photo uploaded on Parasol Unit website. Venue: Parasol Unit, London, U.K.
Parasol unit, a not-for-profit art institution and educational charity for contemporary art in London, U.K., presents Korean artist Hyon Gyon’s solo exhibition. This is the first moment that the artist’s intricate and highly expressive works are introduced to the public in Europe. Hyon Gyon combines traditional Korean textiles, Japanese paper and paint together with various less conventional materials to create her paintings and sculptural installations. One of her recurring techniques is to attach the traditional Korean satin fabric to a canvas or panel, then melt the cloth with a soldering iron. This liquefying effect creates works that can appear cruel, haunting, seductive and chaotic, all at once in paradoxical harmony, which makes it so much impressive that she explores themes of sociocultural identity, grief, anger and sexual politics.